Before you start, always wash your hands. Then mix the insulin, by turning the pen up and down 20 times (this applies to cloudy insulin only). Check that the dose window reads 0, then turn the dose selector knob to 2 units. Hold the pen with the needle pointing upwards. Tap the cartridge holder so that air bubbles float to the top of the insulin cartridge. Push the dose selector knob in as far as it will go – the dose window should read 0. If a stream of insulin doesn't appear, repeat the above three steps. Dial the number of units you are going to inject by turning the dose selector knob clockwise. Hold the pen in your hand with your thumb or finger on the dose selector knob (as the photo shows). If you are using an 8mm (or longer) needle, pinch up skin on your stomach then slide the needle into the skin fold at a 90 degree angle (the photo shows the angle). If your needle is less than 8mm long, don't pinch up your skin. Push the dose selector knob in as far as it will go, until the dose window reads 0. Make sure you change the needle every day and put each injection in a different part of your stomach, as your nurse or doctor showed you. 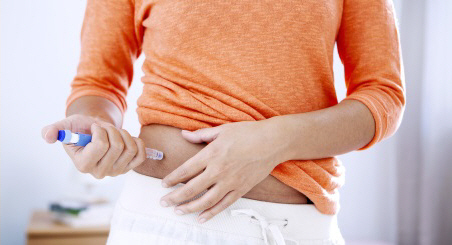 On the next page: What are the alternatives to insulin for type 2 diabetes? Canterbury DHB – How to inject insulin; Diabetes Services, Christchurch Hospital; 7 April 2015; authorised by clinical director, Diabetes Services.